UNM Recycling is a proactive service organization. The primary goal is to provide support to the overall sustainability efforts in and around The University of New Mexico campus by maximizing the quantity of recyclable materials diverted from landfills and identifying new sources and types of materials for recycling. In addition to routine scheduled services, on-call services, and support for annual and special events, Recycling provides bins inside buildings and offices and in outdoor areas throughout campus, at athletic events, and at the UNM Recycling Yard located on the north campus, ensuring ready access to recycling for students, faculty, staff, and visitors. Recycling also collects data on what and how much UNM recycles and reports this information to the New Mexico Environment Department in order to track sustainability program progress. Please contact the UNM Recycling Supervisor at 277-0842 or recycle@unm.edu if you have any questions about recycling at the University of New Mexico. 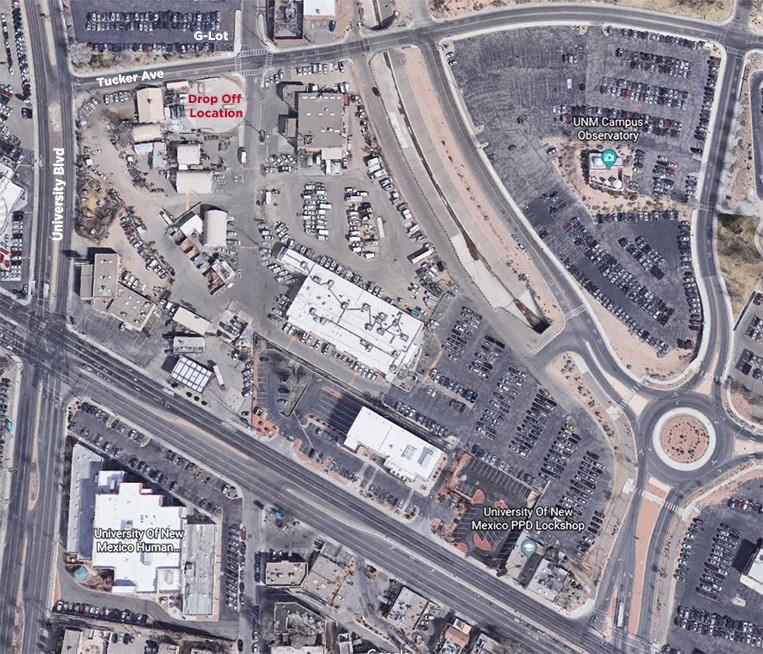 Recycling Yard: 1818 Camino del Servicio – near the corner of Tucker Ave. and University Blvd., south of UNM parking lot G.
What goes in a recycling bin? Incorporation of non-accepted materials or those containing food, oil or grease adds to processing costs and puts the entire collection of recyclable material at risk of contamination, which requires disposal in the landfill. What can I drop off in the Recycling Yard? The Recycling Services Yard is located at 1818 Camino del Servicio – near the corner of Tucker Ave. and University Blvd., south of UNM parking lot G. The following items are acceptable for drop off. Please consult with a Recycling Tech for proper bin location. What happens to recycled material? All aluminum cans collected at the University of New Mexico (UNM) are baled and stored by UNM Recycling. The bales are picked up by Master Fibers, Albuquerque, NM (http://www.masterfibers.com) for further processing at mills in the United States. All batteries are shipped to certified recycling facilities in the U.S. for further processing. These materials are collected by UNM Recycling and are taken to the Albuquerque Rescue Mission in Albuquerque, NM for distribution to homeless people. All cardboard collected is baled and stored by UNM Recycling. The bales are picked up by Master Fibers, Albuquerque, NM http://www.masterfibers.com for further processing at mills in Mexico. Most e-waste at UNM is disposed of through the Surplus Property department via public auction. Any e-waste that is handled by UNM Recycling is sent to Albuquerque Recycling,http://www.albuquerquerecycling.net. Albuquerque Recycling is an R2 certified facility and does not sell or send materials overseas. This category may consist of construction and demolition (C&D) waste, remodeling waste or office type items made of metals such as iron, wrought iron, mild steel, carbon steel, stainless steel and tin. Items made of these metals are collected in a 30-yard open top bin and taken to Acme Iron and Metal in Albuquerque, NM. Please refer to http://www.macraesbluebook.com/search/company.cfm?company=518664 for information about further processing at mills in the United States. All glass collected by UNM Recycling is put into the City of Albuquerque collection bin located on the south side of the PIT on University Blvd. SE. The City crushes the glass and stockpiles it for future use. Fluorescent tubes, Compact Fluorescent Lights, and Incandescent Bulbs are crushed in a special machine on site and shipped off site in sealed drums to a certified recycling facility in Indiana. This type of paper is the lowest grade of paper. It may be a mixture of magazines, catalogs, phone books, brochures, other glossy papers and newspapers. This paper is stored in a 30-yard open top bin. When the bin is full it is taken to Master Fibers, Albuquerque, NM for further processing at mills in Mexico. This category may be C&D waste such as wire, pipe or scrap made of metals such as aluminum, brass, copper, non-magnetic stainless steel or lead. The materials are taken to Acme Iron and Metal, Albuquerque, NM for further processing. This type of paper may be a mixture of white paper, colored paper, newspaper, shredded paper, etc. Office Pack is collected in 30-yard open top bins. When the bins are full they are taken to Master Fibers, Albuquerque, NM for further processing at mills in Mexico. Wooden pallets are collected, rebuilt and resold to local companies. Pallets which cannot be rebuilt are recycled into wood stove fuel pellets by a local company called, WOOD YOU RECYCLE, and sold nationwide. This type of plastic is separated out from other plastics, baled and stored by UNM Recycling. The bales are picked up by Master Fibers, Albuquerque, NM for further processing at mills in the United States and China. This type of plastic is separated, bagged and taken to the City of Albuquerque recycling bins located south of the Pit. From there it is taken to the Friedman Recycling Facility in Albuquerque, NM where it is sorted, cleaned, baled, and shipped to mills in the United States and China. After #1 and #5 plastics are separated out the remaining plastics are bagged and put into the City of Albuquerque collection bin located on the south side of the PIT on University Blvd. SE. The City bales the plastic and sells it to mills. Any office supplies such as pencils, pens, file folders, or staplers are collected and put into the ROSE program for distribution back onto the campus. When this type of paper has been bagged it is collected in a 30-yard open top bin. If the shredded paper is loose and has been mixed with other paper it is handled as Office Pack paper. When the bin is full it is taken to Master Fibers, Albuquerque, NM for further processing at mills in Mexico. Styrofoam peanuts are taken to UPS Stores, given to local small businesses or to the UNM Press for reuse. Lacking any capacity to recycle Styrofoam blocks in New Mexico, they are disposed of in the trash.